ANYWAY, it's Monday, so let's make the best of it! Today, I have not one, but TWO link-ups for you! The first is one that I'm really excited about because it fits in nicely with how I usually like to start my weekly posts anyway. 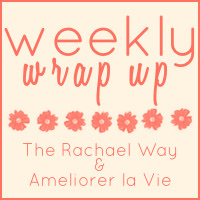 Rachael of The Rachael Way hosts The Weekly Wrap Up with Lisa of Ameliorer la Vie and it's a nice way to recap your week, read about what other bloggers did with their lives, and meet some new people! Let's start with that one! Last week was kind of a hot mess. It all turned out for the best, I think, but going through it was not the most fun I've ever had. On Monday, it snowed, and I nearly committed a felony due to my rage at the seemingly never-ending winter that is plaguing the northeast this year. Monday night, I got a massage and it was amazing and I wish I could go every week. At least I have on scheduled for next Monday! Tuesday, it did not snow, which automatically made Tuesday way better than Monday. I also saw my therapist, which is often the best hour of my week. She is a life saver. Literally. Tuesday night, Ken and I went house hunting and saw a townhouse that we liked enough to consider putting an offer on it. We ended up not doing that. More on that later. Tuesday night, I also packed for my trip and spent a lot of time whining about how I didn't want to go to Florida and how I thought it was possibly a stupid and irresponsible idea. I spent most of Tuesday night tossing and turning, not sleeping very well at all. Wednesday, I woke up at 6 am and couldn't go back to sleep, so I got to work stupidly early. It was Wonderful Stuff Wednesday and I talked about our recent house hunting adventures, including the time we were accosted by wild turkeys. I spent most of Wednesday morning going back and forth about whether I was going to get on my flight to Florida later that afternoon, finally deciding that I couldn't possibly go away for 6 days when there was so much going on here with work and house stuff. I successfully told my dad that I was changing my plans and shocking no one, he didn't disown me. The worst part of the day turned out to be having to lug my bags to and from work for no real reason. Wednesday night, I didn't go to symphony rehearsal because I was in pain and exhausted. I spent most of the night laying in bed watching DVR'd TV. Thursday, I woke up, exceptionally glad that I was not in Florida. Nothing exciting happened on Thursday. Thursday night, a new house came on the market so I emailed Linda to see if we could see it Friday night or Saturday. Me: What's the rule on punching lab techs? Pam: Call Occupational Health if they bleed when you punch them. But, it was Friday, the weather was better, and we had appointments to see houses on Saturday morning. Friday night, Ken and I went to my mom's house for dinner, which was lovely because she made pot roast and there are few things that I love more in life than my Grandma's pot roast recipe and kasha. Sadly, I was so tired that I didn't have time to make challah, but we lived. We got to visit with my mom's friend Janet, who was visiting from NC with her daughter and man-friend. It was a good time. On Saturday, Ken and I got up and saw 2 houses with our realtor. We were supposed to see three, but the second one we were scheduled to see had a broken storm door and we couldn't get to the lockbox. Apparently, the tenant that is currently living there is shady and doesn't like people seeing the house so... I guess he thought he just wouldn't let anyone in? Who knows. We ended up putting an offer in on the first townhouse we saw that morning, which was a lovely end-unit with 4 bedrooms, 2.5 bathrooms, hardwood floors in the living room, and updated an kitchen and bathrooms. The house had only come on the market late on Thursday night, but we were somehow the second offer, so we weren't sure what would happen. I spent the rest of Saturday relaxing, napping, and watching DVR'd TV. It was a very lazy day. I also took my methotrexate, which made me feel like crap. YAY. Yesterday, we were supposed to go to lunch with my brother, my mom, and my mom's friends, but they picked a spot in Philly that is not my favorite and I didn't feel like driving into the city. I rescheduled plans with my friend Patricia for Monday after work, and then spent the rest of the day cleaning, doing laundry, reorganizing my bookshelf, and generally being lazy. The methotrexate really takes it out of me and makes me feel foggy, so I usually end up spending the day after I take it trying to take it easy. Overall, it was a very relaxing weekend and we were even pretty productive. Which leads to our next link-up... Weekly Wishes! 1. Don't murder anyone over the weather. - Check! Good to know, right? Always good to put an easy goal on your list. 2. Be packed before 2 am on Tuesday night. - Check! Even though I ended up lugging my bags to work only to turn around and drag them back home, my goal of being packed was achieved. 3. Actually attempt to learn short rows and work on the shawl. - Thumbs down on this one. I did watch some Youtube videos and look at some tutorials... I just didn't do anything with my project. Whoops. 4. Read something. - Semi-check? I did read a few pages of The Noonday Demon, but I'm still in the history heavy chapter, which bores me. I'm hoping it's over soon, haha. I did put a bunch of books on hold at the library, though! 5. Schedule a freaking haircut. - Check! Friday at 4:45! Highlights and a trim are happening. I'll have a fresh blowout for Accepted Students Day at Rowan this Saturday, too. Strategic hair appointments are key. 6. Vlog. - Totally failed on this one. Not going to Florida, being exhausted, and basically shutting down my brain after leaving work meant that this just wasn't happening. Perhaps this Friday, but... I make no promises. 3/6 isn't bad! 4 if you count reading a few pages as "reading something". Not too bad. I'm especially proud of #1, even though I shouldn't be, haha. Also, I totally reorganized my drawers on Sunday, so even though that wasn't this week's goal, I am still counting it. Whoo! I can finally find things! 1. Get blood work drawn. I have been holding onto a prescription from my primary care doc and one from my rheumatologist. (Side note: Blogger thinks that "rheumatologist" is not a word. What the heck?) They're not urgent in the I might be dying sense, but I'm sure my doctors would like results from them. 2. Go to the library to pick up books on hold and donate old ones. While reorganizing my bookshelf over the weekend, I thought about how much I don't want to move all of these books the next time we move (which theoretically could be this May/June). I also thought about how I needed to really go to the library to pick up all of the books that I've been putting on hold. If I don't go by tomorrow, they're going to put some of them back, which would make me sad. Not that I couldn't just request them again but... it's the principle of the thing. 3. Put together a blog schedule of sorts. I'm not sure if I'm 100% ready to schedule my posts out for weeks at a time, but I would at least like to have some idea of what I'm writing every week. I haven't been good at writing with any kind of consistency, and I feel like I'm kind of all over the place with content, so I want to try and focus on what I want to be going on here. I am thinking about getting this planner printed and bound at Staples. Has anyone used this or another blog planner that they like? 4. Get my viola to the luthier for new strings and decide where I want to take my bow(s) for rehairing. Sad day, indeed. I don't even remember how this exactly happened because it was so long ago, but after researching a bit, it seems like it should be fixable, even if the value of the bow is totally shot. I was never planning on selling it, so I'm really just going to happy if it's usable. We'll see. There is a place in Haddonfield that I could try, and there is a bow maker/repairer in Mount Airy that comes highly recommended. Decisions, decisions. 5. Purge my closet, find the holes in my wardrobe, and figure out a plan of attack to fill them. Ok, so this is more of a three step goal, so maybe I should just stick with "purge my closet". I find that I wear the same things every week, while much of my closet's contents languish in disuse. I've also recently lost 15 pounds (although not in any way I'd recommend) and my clothes all fit differently now. Some are still wearable, but others need to go (looking at you, size 12 jeans and size 10 work pants). Basically, this is another declutter/organizational push spurred on by the potential move in our future. Less to pack! Also, an excuse to buy new clothes? As much as I dislike shopping, new clothes are always fun. Happy Monday, all. Don't forget to link up with Melyssa and Rachael for either of these link-ups. Meeting new people always brightens my Mondays! I hope you get the townhouse that you put an offer on! Thanks for linking up with us! Haha, thanks! It was definitely tough at time, haha. I checked out your blog(s) and I can't wait to read more! Thanks for stopping by; hope to see you around! So... is getting your instrument checked once a year a thing? Because, well, let's just say me not so much. I DO need to get my violin rehaired, though. Immediately. 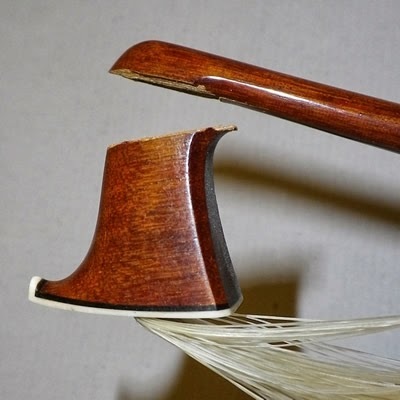 I actually need a new bow altogether.